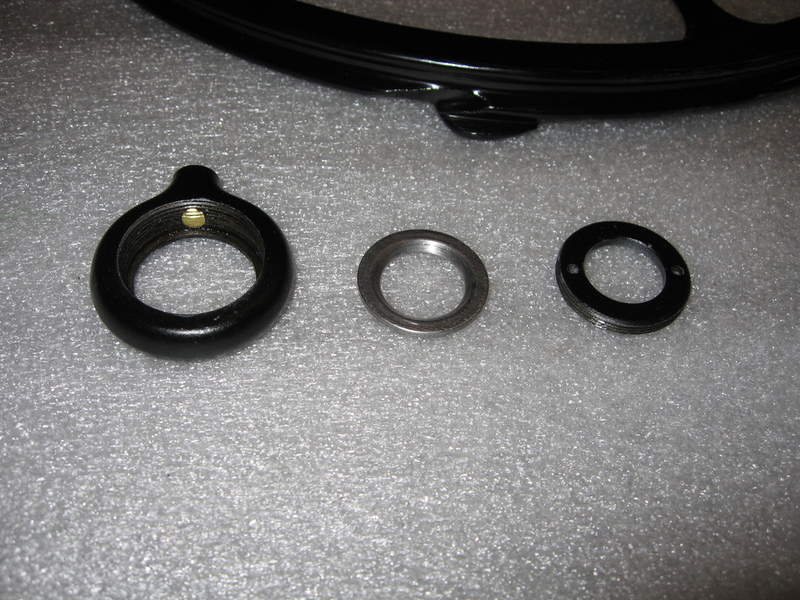 Again, disassemble this into its component parts so it’s easier to work on. This was the perfect excuse I needed to replace the Honkin Huge Screwdriver that disappeared with my ex-husband. A lot of these bolts were stuck pretty firmly; PB Blaster wasn’t helping, so I used the old trick of using a crescent wrench to turn the screwdriver. Voila. My original plan was to scrub the rust and paint off of “the irons” (as they are called) and then spraypaint it black. 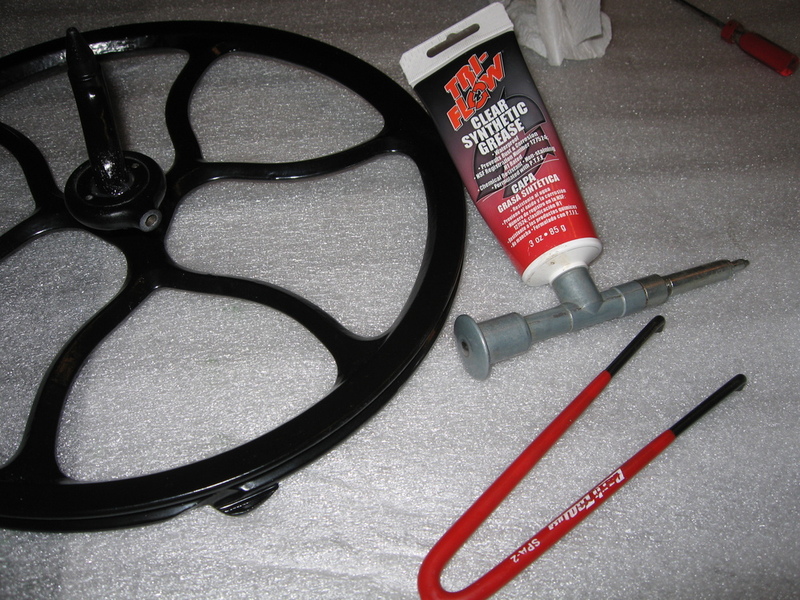 I spent a couple of hours just on the screws, and when I discovered how much rust there was under the paint that was covering the pedal, well… when my sweetie suggested (again) “You know, you could just take this to the powder coaters that is right around the corner“, I agreed. Best $100 I spent this year. It’s a simple machine, but again, take lots of photos when you’re taking this thing apart. There is a pretty good text guide here. – attach belt control to dress guard, to minimize the number of pieces you need to keep track of. 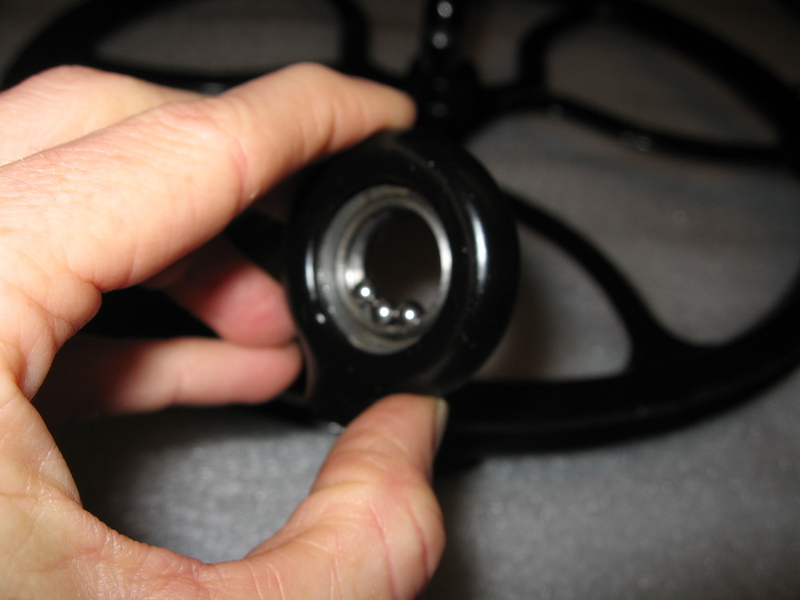 – like any other project involving multiple fasteners, get each bolt threaded just a bit before you start tightening them. – connect the pitman to the drive arm. – attach dress guard. I don’t have the belt thrower reattached correctly yet; the spring has lost a lot of its spring over the past century. Connecting the pitman to the drive arm was the hardest part; the bearing housing + bearings had to be reassembled in place around the drive arm. This requires very sticky grease and/or an extra set of hands to help chase bearings around the workbench. So! This machine is up & running new, and I sewed actual fabric (a quilt block) with it this week. 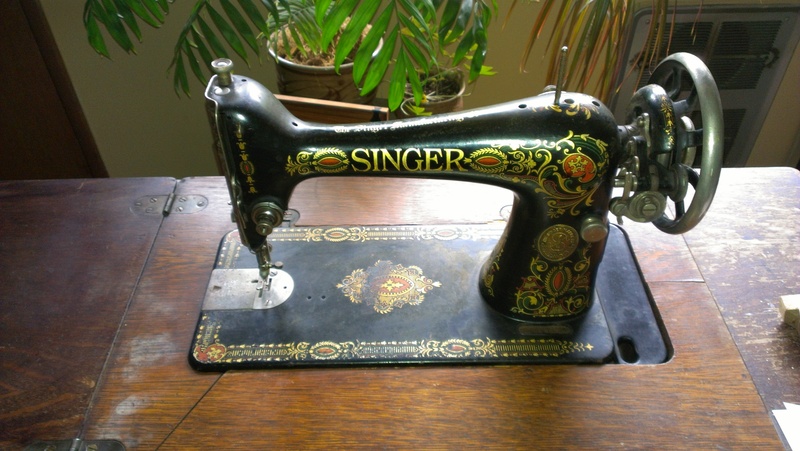 I spent a good amount of time learning to work the treadle without thread in the machine, and then stitching on paper, before I tried to work on a project. It is a lot like learning how to drive :). And now for something completely different…several months back I picked up a 1912 Singer model 66 “Redeye” off of Craigslist. 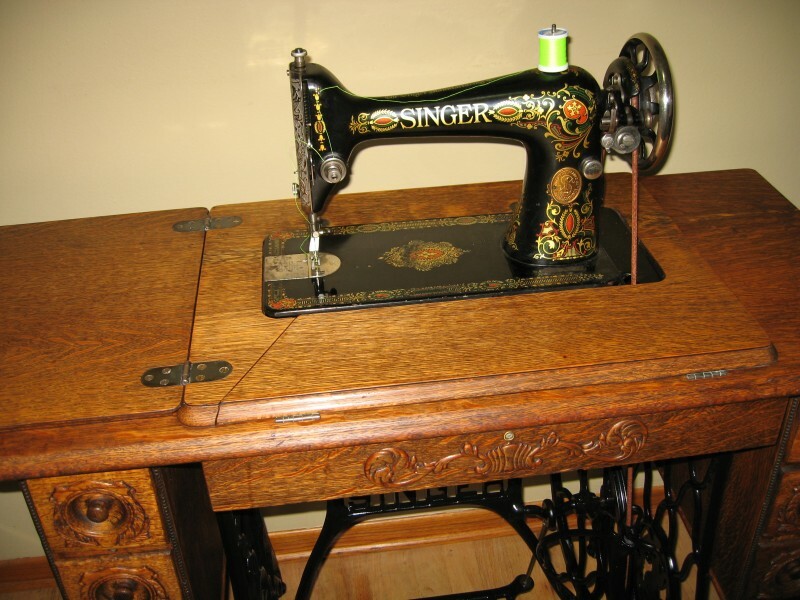 I was looking for a completely different machine, but I’ve wanted a treadle for a long time, and from the photos it looked in ok shape. One thing led to another and I found myself driving a ways east of town on a reasonably nice day that I otherwise would have spent biking, to check out this machine. – the decals on the head were in pretty good shape overall; they tend to get rubbed off with use. This machine is over 100 years old, after all. – paint splatters all over the cabinet; it was going to need stripping completely. I’ve since decided that one should examine these things in daylight and not in a warehouse. As an alternative, flash photos will highlight problem areas better than you can see them with your eyeballs. And next time, I’ll bring a belt with me so I can determine whether the machine runs or not. That said, I’m glad I bought it because fixing it up was a good experience and I now have a machine that sews better than my formerly TOTL European machine :koff:Bernina2:koff: for much less money. And yes, these things are “heavier than a dead preacher”3 so come prepared with additional muscle or tools to tear it down so you can take it home easily. Or both. All of these took significantly more time than I expected; I really didn’t know what I was getting into. To keep posts to a reasonable length, I’ll talk about the cabinet & head outside first, and the treadle and head internals separately. A full photo set is on flickr. As I mentioned, this machine’s decals were in pretty nice shape. I was interested in keeping them that way, so cleaning the outside of the head basically just involved rubbing them very very gently with oil in order to remove the grime. My BF actually volunteered to do this, but then, he used to detail cars, and has the patience for this kind of thing. This is probably anathema to some people, but I didn’t want to look at the “patina” (read: yucky old brown finish), so off it came with some rubbing alcohol. A coat of carnauba wax made it shine again. Metal polish took most of the rust off of the chrome pieces, and that was that. In addition to the layer of grime, this machine appeared to have been left uncovered while someone nearby spraypainted. 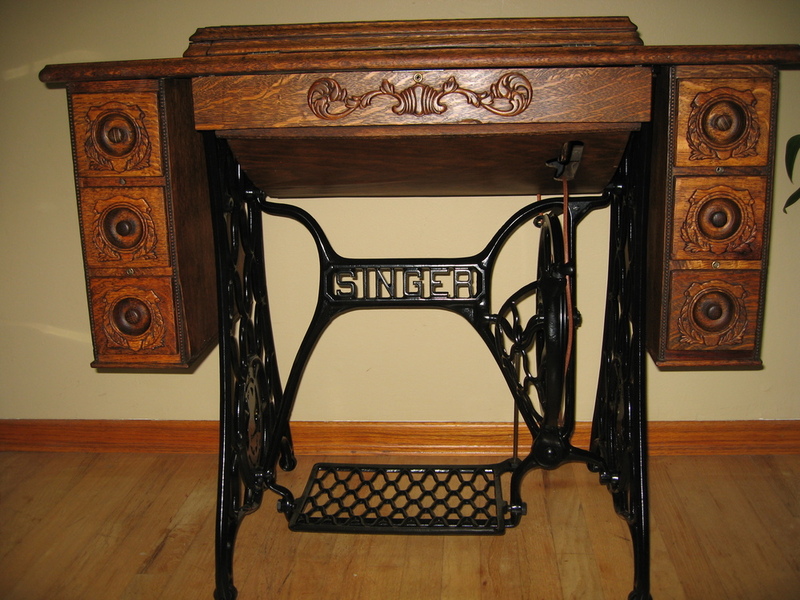 The treadle pedal was almost solid white and the cabinet was speckled all over; there was even a handprint on the back. I broke the cabinet down into its component pieces and used Citristrip to remove the old finish. Citristrip does a much better job indoors at temps over 60*F than in a 40*F garage. This was my first time stripping carved wood, and I don’t intend to repeat the experience. – glop on the citristrip & wait until it’s ready. If it’s starting to get clear & a little dry, like it’s “setting up”, it’s getting close. 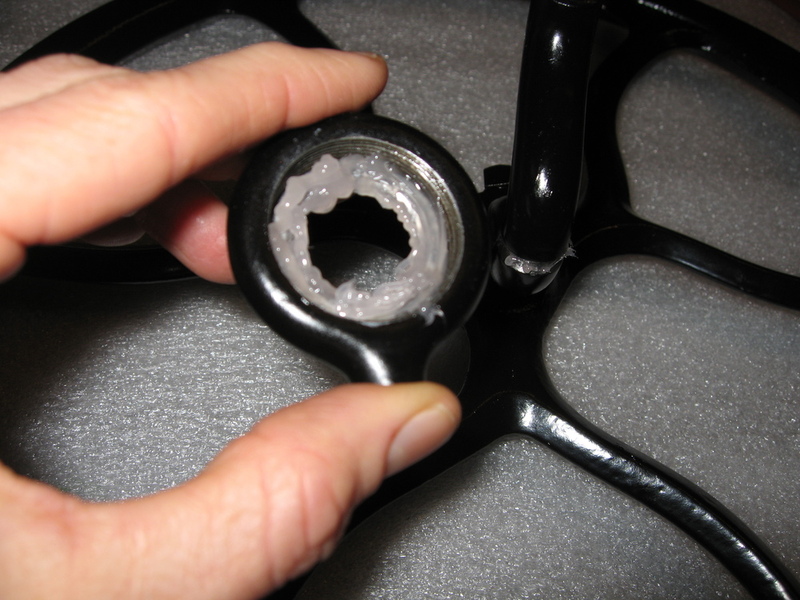 – with a plastic scraper, remove as much of the stripper & old finish as you possibly can. Old credit cards work great for this, if you are too cheap to go buy something you are just going to throw away anyway. – around the carved wood, I used a brass brush to get rid of the stripper. This is not recommended for soft woods, and probably wasn’t advisable for oak – IOW, don’t do this. A stiff nylon brush would have been easier on the wood, but didn’t do jack about removing the crud. The PNW is a very humid environment, and the veneer had buckled and pulled away from the core over the years. Just few small chips were missing, so I opted to re-glue the loose veneer. I only own a couple of clamps, so this step took several days. Once the wood was dry, I filled the screw holes, sanded that down, and then all that was left was a quick buff with 0000 steel wool (which I’m told is too fine for oak, but it made a palpable difference), a swipe with tack cloth, and it was ready for finish. I use Tried & True Danish oil on almost all of my wood furniture; it’s not as protective as polyurethane, but it’s a lot easier to apply and I love the way it looks. And smells. I put two coats on for now, and then reassembled the cabinet. 1 – The head is the part that actually does the sewing.